Armani Curtis and her family live in the Lower Nines of New Orleans. They've heard that a storm is coming, but Armani begs her parents to stay in town because her birthday party is on Sunday -- the same day Hurricane Katrina makes landfall in New Orleans. Armani's birthday quickly shifts from celebration to a scramble for her family's lives as the levees break and they must outrun the wall of water coming toward their house. Heartbreaking yet hopeful. Terrifying yet beautiful. This middle grade debut novel by Julie Lamana is a page-turner that will leave you staying up late into the night to finish. And yet, despite not being able to stop turning pages, it is also a difficult read, but it's an important story to tell. The ending, while certainly a realistic portrayal of the heartbreak people had to endure in New Orleans after Katrina, left me feeling empty and unsatisfied. Not because it ended the way it did --I understand why it had to end that way -- but because it ended when it did. I got to the last page and thought to myself, "But surely there's one more chapter, right?" Finally, I want to talk about the cover. 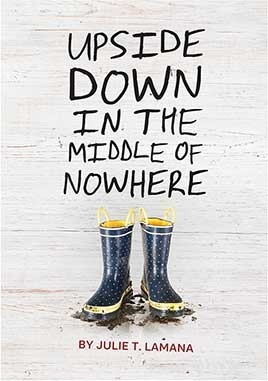 While the rain boots on the cover are significant to the main character, I have to wonder if this was a story about a white family if this would be such a non-descript cover. There seems to be this unspoken rule that publishers don't like to put black faces on the covers of books. Not only are there no black faces on the cover, but the background is so white it's literally whitewashed. This lack of diversity or HIDING of diversity in children's literature is not okay in 2014. And despite the fact that the author has nothing to do with the cover, it slightly marred my experience reading this book because all I kept thinking about was the exposing of racial inequality Katrina brought out in our country, and so the obvious refusal to put the face of a black character on the cover of a book just speaks even further to that inequality. I have always respected Chronicle Books and will continue to read their books, but I also want them to know that I expect better from them in the future.